A rare gold pin designed by Queen Victoria to commemorate her faithful ghillie John Brown after his death in 1883, will go under the hammer next week. The memorial lapel pin shows Brown’s head and initials on one side and the Royal monogram on the other. It was designed by The Queen to give to her Highland servants and cottagers, to be worn on the anniversary of Brown’s death with a mourning scarf. The pin, in yellow and white gold, will be auctioned at Lyon & Turnbull’s sale of Scottish Silver and Applied Arts on August 15. Brown – played by Billy Connolly in the 1997 film Mrs Brown – was known during his lifetime as “The Queen’s Watchdog”. Born at Crathie in Aberdeenshire, he was stationed at Balmoral Castle, which Queen Victoria and Prince Albert purchased in 1853. He became the queen’s personal servant following the Prince Consort’s death in 1861 and was a constant presence at her side until his death at the age of 56. Queen Victoria appreciated Brown for his competence, loyalty and companionship, although some resented Brown’s influence on the monarch. She was hugely distressed by Brown’s death and commemorated him with a number of statues and portraits. Later, would have a lock of his hair, a photograph and a ring given to her by Brown inserted into her coffin. To demonstrate her affection for Brown, an Aberdeen jeweller was commissioned to create the pin in his honour. It is expected to appeal to collectors around the world with an interest in Queen Victoria and the monarchy and is expected to fetch about £2,500. A Lyon & Turnbull spokesman said: “Although unmarked, these gold and silver stickpins are known to have been supplied to Queen Victoria by Rettie & Sons of Aberdeen. 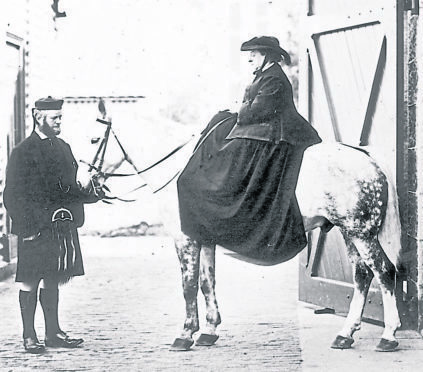 “They were commissioned soon after the death of her favourite and closest attendant at Balmoral who had helped her through the difficult time after her husband’s death.